They are characterized by a solid construction and durability. Safety-related components are mounted outside the storage chamber to increase corrosion protection. The door is equipped with a cylinder lock and an integrated closing status indicator (red/green). avilable widths: 1193 mm, 893 mm, 599 mm. available widths: 1193 mm, 893 mm, 599 mm. 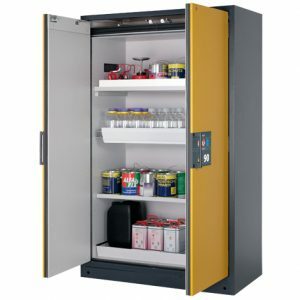 They are easy to use, safe and comfortable cabinets. Safety-related elements have been installed in a way that protects against corrosion. Doors equipped with a cylinder lock to prevent unauthorized use. 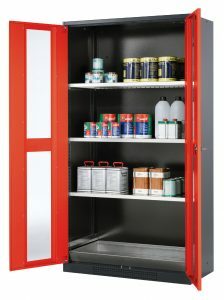 The cabinets are available with standard wing doors and space-saving folding doors. A collecting tray at the bottom of the cabinet allows for safe removal of leaks. 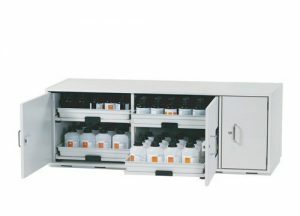 It has been secured with a tripartite gasket, while the perforated cartridge ensures optimal use of the interior of the cabinet and is the first level of storage. 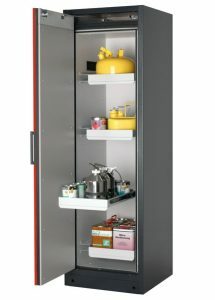 They are easy to use, safe and comfortable cabinets.. The door is equipped with shock absorption and opening lock with the possibility of opening and closing each door independently of each other. 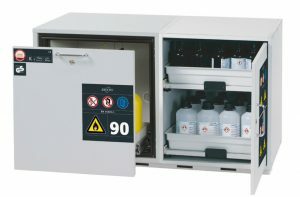 The cabinet is equipped with two hermetic separated chambers with separated air outlets. Corrosion resistant, made of metal-free material. Special edge seals protect against dangerous vapors from inside. The door is equipped with a cylinder lock with the possibility of integration with the central locking system. 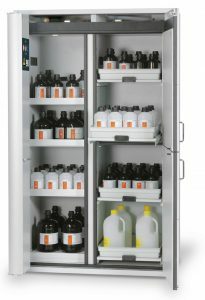 The cabinet is equipped with removable polypropylene cuvettes. 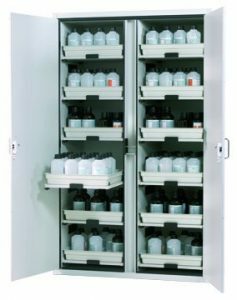 The cabinet can be adjusted on uneven ground. Doors in three variants to choose from: wing, wing with opening windows and folding. 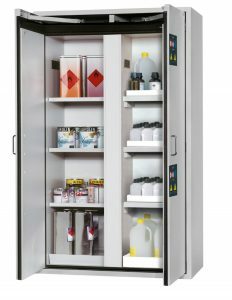 The cabinet is equipped with solid, high quality, extensible guides with metal shelves and a ventilation channel at the bottom. Equipped with a secure integrated cylinder lock in a round, rotatable lock. The possibility of leveling the cabinet on uneven ground. 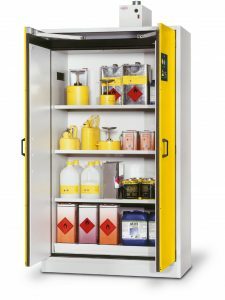 They enable safe storage of hazardous substances in the workplace. The outer body has been made of powder coated sheet and the internal body is made of special melamine-coated panels. and special plastic gaskets protect against the escape of hazardous fumes from the inside of the cabinet.